Whitening is appropriate for most patients but its important you get a dentist to check your teeth before you start whitening because you may have problems or fillings that could be worsened or damaged by whitening. Also often a clean which removes calculus (tartar) and stains from your teeth can improve the shade (brightness) of your teeth significantly without the need for whitening! Tooth whitening is becoming increasingly popular for both men and women. In short if you want to improve the shade of your teeth whitening is often a great option. Book an appointment with us today or mention it to us at your next appointment. At home bleaching is the simplest and easiest form of bleaching and gets great results. It uses a concentration of whitening agent (carbamide peroxide) which causes less sensitivity to the teeth and is used over a longer time period of a 1-2 weeks usually to get great results. 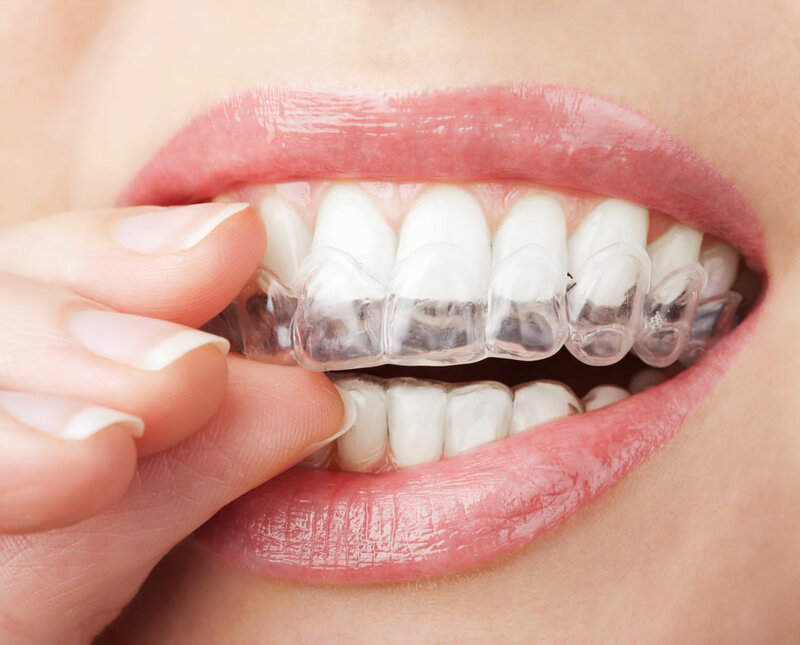 We take impressions (moulds) of your mouth and teeth, so we can make custom bleaching trays to fit your teeth, these trays are clear and constructed with small 'wells' on the front side of the teeth to hold the whitening agent against the front of the teeth. Come pick up your trays and we will run through how to use the trays and the whitening gel. We will also provide you with clear written instructions to take home with you. Got a big day coming up soon or just want to get your teeth bleached fast. In chair bleaching uses a high concentration whitening agent which is safely applied by our dentists. In 60-90 minutes we can achieve a great whitening effect similar or better to that of the at home system! Also some of our patients choose to supplement this with at home bleaching, to get the maximal result. Some patients report some increased sensitivity in their teeth but this is usually gone within a day or two. Come in to the surgery (bring some headphones with you!) and we will give your teeth a clean first. We then apply and set hard a barrier which covers the gums to prevent any of the bleaching gel getting on the gums. We place the high concentration bleaching gel directly onto your teeth, making sure they are all covered equally, we wait and monitor the whitening process over a ~20 minute period. Rinse and repeat up to 3 times for the desired result. If you have any questions about these procedures please dont hesitate to contact us and we can answer all your questions in great detail. Many factors make teeth lose their luster. Genetics is one factor; some people just have whiter teeth than others. Other factors include cigarettes, dark foods and beverages (including coffee, tea, soft-drinks, and red wine), age, medications (such as tetracycline), and tooth trauma. 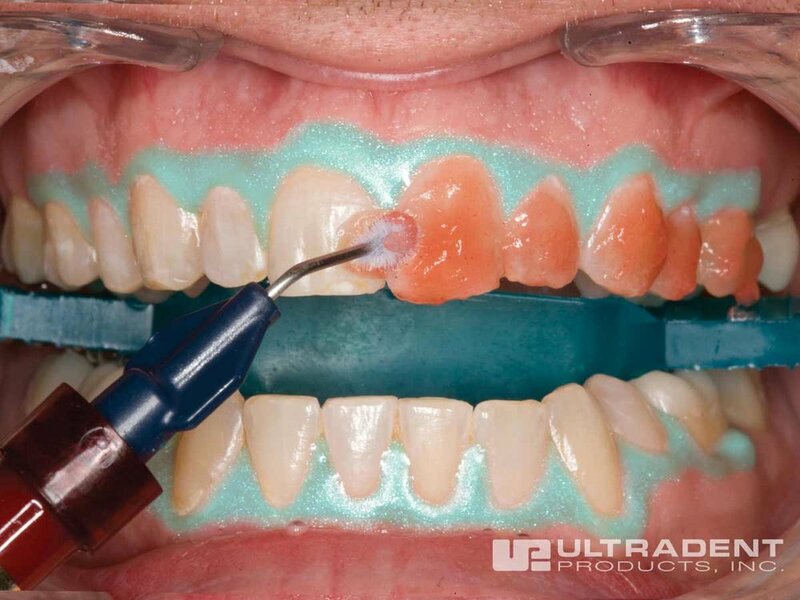 Teeth can be stained on the outside (extrinsic) or on the inside (intrinsic), extrinsic stains can often be cleaned off by a professional clean, however intrinsic stains are best addressed with whitening. This is why it is best to start off with a clean before commencing whitening to make sure you are getting the best results! Done incorrectly it can, there has been some concern recently about some beauty therapists and others who are untrained using high concentrations of bleaching agents and bright UV lights to try whiten teeth. The Australian Dental Association has launched a website (toothwhiteningfacts.com.au) to educate the public on these dangers such as chemical burns or permanent damage to the teeth. Additionally without a proper assessment of the teeth to be bleached you can end up with an uneven colour change or other problems. Apart from whiter teeth?! Some patients can experience some sensitivity (such as to cold) while they are whitening their teeth, this usually resolves quickly once the whitening is done. Sensitivity isn't a sign of damage to the teeth its just If it becomes too sensitive during whitening it can usually be managed by leaving a few days between application of the whitening gel. Additionally the whitening products we use contain a de-sensitising agent (potassium-nitrate) to reduce sensitivity and fluoride to strengthen your teeth. Teeth whitening results are very stable, leaving you with a stunning smile long after treatment is over. However, there are a few factors that can make teeth lose their luster. Things like genetics, diet, age and certain habits (like smoking) might affect the length of your whitening results. Fortunately, touch-up treatments are quick and easy if you keep your custom tray, helping you get that bright, white smile back. Why Don't You Use The Light?! Some practices promote using a bright Ultra-Violet light or a laser to "activate" the whitening agent this is often marketed under the name ZOOM WHITENING. In actual fact quality research has showed us that the light makes no difference to how white your teeth are in the end. There is some evidence that the light makes the teeth whiter in the very short term because its so bright it dehydrates the teeth which makes them whiter, however within a few hours of leaving the clinic the teeth rehydrate from moisture in your mouth and return to a slightly darker shade. Also as any sunsmart person would know Ultra-Violet light can damage your skin and lead to skin cancers in fact its just like a solarium. So if it doesn't lead to whiter teeth and it might be bad for you we choose not to use it on our patients.